An anti-piracy firm has found a shortcut to obtaining the personal details of account holders connected to pirating IP-addresses. Instead of having a judge decide, Rightscorp obtains so-called DMCA subpoenas which only a court clerk has to sign off on. A worrying development that could lift the copyright troll business to a new level. Week in and week out hundreds of U.S. citizens are dragged into lawsuits because their Internet account was used by someone to share copyrighted material. These cases all follow a familiar pattern. The copyright holder files a lawsuit mentioning several IP-addresses, and asks the court for a subpoena to identify the account holders connected to it. It’s then up to a judge to decide whether or not the subpoena should be granted. If it is, ISPs usually inform the affected customer who can then appeal the disclosure before a judge. If this fails, the personal details of the subscriber are handed over by the ISP, after which the affected user usually receives a settlement request from the copyright holder. This is how file-sharing cases have worked for years, and on the surface it appears to be a fair process. However, for piracy monitoring outfit Rightscorp this process is proving too cumbersome. Instead of arguing their case before a judge, they’re using a shortcut that will be of great interest to copyright trolls. A few weeks ago several people received a settlement request from Rightscorp via snail mail. This is peculiar since the company generally doesn’t know who the account holder is. As opposed to classic copyright trolls, Rightscorp usually sends its settlement requests via DMCA requests. Perhaps even more worrying, the settlement letter in question mentions a subpoena. Not a regular one, but a DMCA-subpoena, which bypasses the judge and only has to be signed off by a court clerk. In other words, Rightscorp used an uncommon shortcut to cheaply and quickly expose the alleged pirates, and the ISPs in question happily complied. Wondering why all other trolls aren’t doing the very same thing, we asked several legal experts for advice. Without exception they told us that DMCA subpoenas are not meant to be used against ISPs who only pass through information, only those who actually store content. This was decided in a case between Verizon and the RIAA more than a decade ago, and has been upheld in subsequent cases. “The RIAA v. Verizon case clarified that 512(h) subpoenas could only be issued to service providers who hosted infringing content directly on their servers. Because in filesharing cases the allegedly infringing material is stored on users’ systems, 512(h) subpoenas are inapplicable,” Cathy Gellis, a technology lawyer in the San Francisco Bay Area told TF. 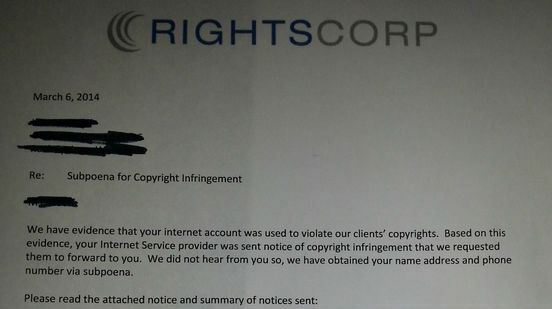 So why is Rightscorp using these DMCA subpoenas? We asked the company, and CEO Christopher Sabec said that they believe the court made the wrong decision at the time. According to Sabec the verdict won’t hold up at the Supreme Court, so they’re ignoring it. “The [RIAA vs. Verizon] Court case used flawed reasoning in concluding that an ISP such as Verizon is not a ‘Service Provider’ even though it clearly meets the definition laid out in the statute,” Sabec told us. “The issue has actually not been addressed by the vast majority of Circuit Courts. We believe that the decision you cite will be overturned when the issue reaches the Supreme Court,” he adds. 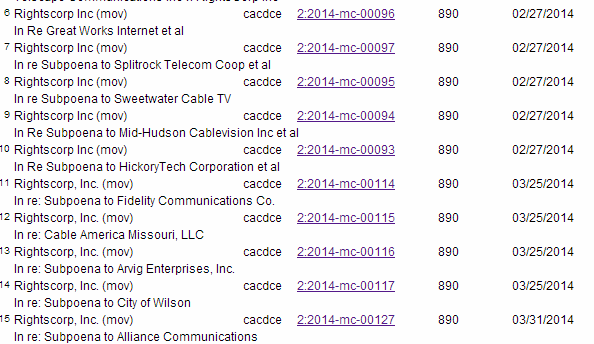 It’s worth noting that for now Rightscorp is avoiding any of the major Internet providers. Below is the list of ISPs that were targeted, which includes Fidelity Communication, Sweetwater Cable and even the City of Wilson. Of course, these smaller organizations are less likely to object. The cases above make it clear that court clerks have no problem with signing off on these requests. As a result, Rightscorp obtained subpoenas for hundreds of IP-addresses at virtually no cost. 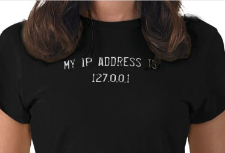 In the case of Fidelity Communication alone, court records reveal more than a hundred pages of IP-addresses. While it seems that Rightscorp is currently the only party to use DMCA subpoenas, it wouldn’t be a surprise if some of the classic copyright trolls now follow suit. After all, it’s much easier to obtain people’s personal details when a judge isn’t looking over your shoulder.